Ordinance committee members unanimously approved new rules that would prohibit what Council President Tom Livingston (D-District E) called “real noisy construction stuff” on weekends, move back the allowed construction start time from 7 a.m. to 8 a.m, and set special maximum noise levels for the Washington Street area, where residents live in close proximity to bars. 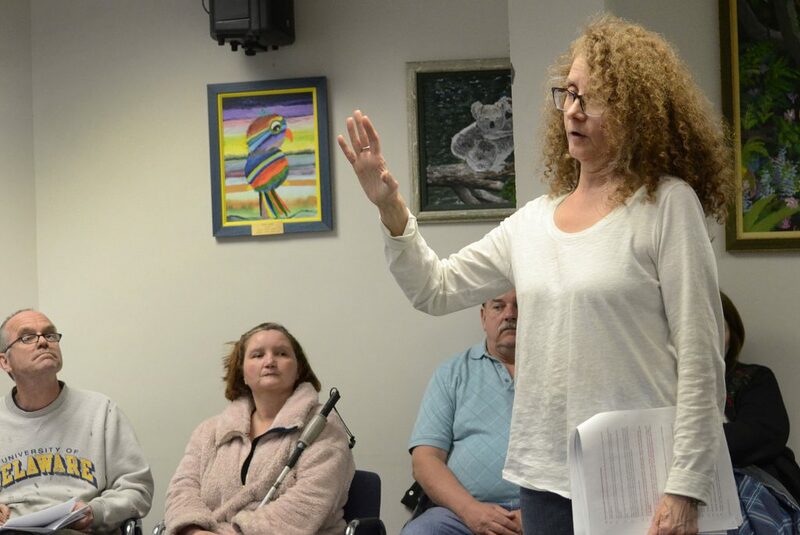 “I have lived here for 26 years now and the noise has been a problem almost all that time… I am very glad you are doing this, I hope it all works,” Mary “Ann” Frimmett said to the Ordinance Committee at its Tuesday meeting, after the vote. If the full Council greenlights the overhaul at its next meeting, probably in May, the admittedly “not perfect” ordinance will be sent to the Connecticut Department of Energy and Environmental Protection (DEEP) for final approval. Several residents pleaded, at the meeting’s start, for relief from noise. Tracey Dinkin objected to “constant” noise in the Fodor Farm area, where she lives. John Ryan, Dinkin’s husband, decried noise from endless landscaping. “No one should be allowed to buy a home and then find out later it’s not conducive to living,” said Vernon Howard, a SoNo resident. One of his neighbors said he’d rented a SoNo apartment sight unseen due to a job relocation, and felt the landlord had deceived him. “I am moving from Norwalk, out of state again with my job, because I feel apathy and ignorance from bar owners,” he said. Two Rowayton residents complained about “intolerable” noise from a year-and-a-half of work to remove ledge for a construction project on Meeker Court. “I could shout at the top of my lungs and not hear myself,” Dana Laird said. “The icing on the cake” was a pneumatic tool and an excavator pounding rock 50 feet from her head, which woke her up at 7 a.m. on Labor Day, she said. “It sounds like a jackhammer on steroids,” Lynn Stephens Massey said. Diane Lauricella, representing South Norwalk Citizens for Justice, said she’s heard complaints of dumpsters emptied at 2 a.m. The longtime activist called for inclusion of recycling trucks in the ordinance’s language because, she said, the term “solid waste” doesn’t cover them. Lauricella also requested an emergency meeting with Norwalk Police who she alleged don’t have the right attitude when investigating noise complaints. After public comment ended, Council members tweaked the ordinance. Livingston led the tweaking, with a lot of input from Colin Hosten (D-At Large), who noted the availability of quieter leaf blowers. Doug Hempstead (R-District D) questioned the efficacy of allowing residents but not contractors to work on their lawns on weekends, noting that residents can also buy loud equipment. Livingston said he’d worked with Assistant Corporation Counsel Brian Candela to define construction work as jack hammering, pavement breaking, pile driving and removal of matter. The “real noisy construction stuff” would be prohibited on weekends and holidays, and would only be allowed between 8 a.m. and 5 p.m., he said. He agreed with Massey about the noise from Meeker Court, which both said could be heard at Bayley Beach. Emergencies would be exempted, Council members said. “I am concerned about stifling the city’s growth. All development is going to be more costly,” Michael Corsello (D-At Large) said. “The question ultimately asks, what is the price tag that we place on people’s health?” Hosten asked. “I recognize the problem, the solutions just are very complicated,” Corsello said. Hosten, Livingston and Hempstead all noted that construction of The SoNo Collection mall on West Avenue is happening outside of the hours allowed by the present ordinance. Concerns about residential areas abutting light industrial zones need to be dealt with later, they said. Council member Darlene Young (D-District B) who is not a member of the committee, disagreed. Hempstead said the ordinance could be tweaked while the state DEEP completes its required review. “We don’t know how long it will take, that’s why we need something to get it going,” Committee Chairwoman Eloisa Melendez (D-District A) said. Corsello objected to Melendez’s suggestion that leaf blowers be banned on Sunday. “Why are we excluding one activity?” Livingston asked. Leaf blowers are banned in Rye, N.Y., Massey said from the audience. Melendez had said they’re banned in Greenwich. The ordinance is “not perfect but it’s an improvement and it’s a way to move it forward,” Hosten said later, echoing a common sentiment. Further tweaks included gender-neutral language and the substitution of “noise control administrator” in place of “police chief.” The term “civil penalties” was switched to “fines” during a discussion of enforcement. Afterwards, Lauricella thanked the Council members for the “thoughtful” discussion. Dinkins said she appreciated the work, and asked when she can complain again. Next week’s Council meeting is likely to be cancelled, so the next opportunity would be May 7, Livingston said. SoNo bar owners complained during multiple prior discussions that the proposed ordinance would hurt their businesses and could even force some to close. Speaking of tools – Do the Police have calibrated noise measuring equipment with them to enforce this ordinance? Ratepayers of Norwalk have long wondered whether or not city officials had any respect for quality of life issues. We now have an answer from at least one CC member. Administrator would be more appropriate. When I think of quiet bucolic neighborhoods, Washington Street is the first place that comes to mind. And living on top of a nightclub thats been there for 20 years is also a prerequisite. “Do the Police have calibrated noise measuring equipment with them to enforce this ordinance?” – excellent question, Mitch. There is a free app called ‘Soundprint’ which is a great smartphone tool for exactly that purpose and of course it can be used by anyone. The app was designed to allow croudsourcing of information about restaurant noise levels, but obviously has broader uses. It works quite well, plus: free. Rem, you’ve presented what appears to be a false equivalence. These two situations may appear to be the same because the common factor is noise, but while you’re free to leave, or not even enter a noisy restaurant, you are helpless to control some noise factors effecting your quaility of life at home. I had reached out to several Common Council members about recent extremely loud construction noise just outside my neighborhood, when I was unable to escape the noise in my own home–am glad to know that we’re starting to really consider “quality of life” issues such as this in Norwalk. Norwalk’s building code should include noise (sound) isolation specs for residential units above or adjacent to commercial space.